My hometown is famous amongst Parks & Recreation lovers as Jerry Gergich’s favorite vacation spot, but Muncie, Indiana is also known in some circles as Middletown— the city at the center of Helen and Robert Lynd’s 1920s study. The Lynds lived in Muncie, IN for a year in an effort to observe and record the average American city. Their study began nearly a century’s worth of research on this East Central Indiana, post-industrial city, home to 65,000 people. During my undergraduate degree, I participated in two projects called “Everyday Life in Middletown” (EDLM) which made contributions to the continuation of the Middletown studies. In 1937, the Mass Observation (MO) movement in England sought to “take the temperature” of the British people. Historians have since used this archive to understand the lives of average people in England prior to WWII. EDLM is inspired by the methodological approaches of MO and enlists Muncie residents to write day diaries, on particular days each year, recording their “everyday lives.” EDLM encourages diarists to participate in writing history as a democratizing practice. Throughout both iterations of these projects, digital visualization components were emphasized in planning but never successfully implemented. During a semester long immersive-learning seminar, we created a documentary and a website, both efforts towards this goal. In the second iteration, we’ve streamlined the website to serve as a blog and digital archive for the long-term project, now operating under the Ball State University Center for Middletown Studies. The website so far unsuccessfully encourages participation and discourse on the common ground of everyday life. While the intent of the project has remained successful, the visually engaging, digital components have never been developed to their full potential. Audience:There is an existing audience invested in the Everyday in Middletown project specifically and the Middletown studies generally. Most Muncie residents are aware of the significance of the Middletown studies, and the Center for Middletown Studies receives significant interest from academic audiences nationally and internationally. My argument is that creating engaging digital components to highlight the Everyday Life in Middletown diaries and their contents would encourage other Muncie residents to join the project. It would also encourage existing participants to be more active in the project, promoting EDLM locally. Comparison with existing projects:Mass Observation has an existing online archive. During our early implementation of the EDLM project, we worked with MO, learning from their archive and from the direction they’d like to take their organization as it becomes increasingly digital. EDLM is inherently different from MO in that it is born-digital and should utilize more digital tools to educate and create interest in the project and its mission and objectives. Description:I will try a variety of digital tools we’ve learned about this semester (historypin, voyant tools, etc/ suggestions welcome) to find interesting ways to look at the existing diaries in the EDLM archive. I know that the EDLM team has had these discussions before, so I can also find out how they are in-line with their current objectives. Once I’ve found an effective and visually compelling way to engage with the diaries, I will work with the EDLM team to integrate these visually-engaging ways of reading the diaries into their website. Outreach and publicity: I will work with the director of the the Center for Middletown Studies to implement these tools and insights into the diaries and to integrate them into the existing website. EDLM has a fairly active social media presence to promote these new digital components. Evaluation: There is currently low-engagement with the website. Any increase in traffic should be notable, and any online-conversation would indicate some success in reaching new audiences. An increase in volunteer diarists would also reflect success in gaining traction in the community. As time passes perspectives change, whether it’s over the course of years or a single day. General Horatio Gates was beloved by the men he commanded and respected by his peers, including General George Washington, but mistakes were made and the view of Gates changed from honorable to disgrace. The choices of Gates and the people he surrounded himself with are preserved in his personal papers, including journals and correspondence. By using these primary sources one can analyze different aspects of Gates’ life, from his financial situation to military orders. I plan to use these primary sources to map where Horatio Gates travelled throughout his life. Most of his letters and journal entries include the location of the sender and/or the receiver. Information in these letters tie into historical events, such as the increasing hostilities between British authority in the American colonies, which Gates discusses with his fellow British officers in his letters in 1766. I propose mapping these locations and imbedding a scan of the letter along with a brief transcription of it contents. By including a scan of the primary source and presenting the information it contains, viewers can gain experience using primary sources to perform their own analysis. First I will create the map using ScribbleMaps, an online Google Maps software. Here I can plot the locations, attach the scans from Horatio Gates’ personal papers currently on microfilm at the National Library at Mount Vernon and include a brief description of each. Then I will upload the map onto MapSeries, a online map story software. In MapSeries I can create a website format around the maps and include background information that is relevant to the letters. Once this project is published for the public I can possibly attach the site to the digital encyclopedia page on Horatio Gates. This resource will provide primary sources for French and Indian War as well as American Revolution era researchers. It is also a resource for people who are not familiar with using primary sources. By presenting the source and the information one can obtain from it the viewer can learn the value of primary source research. George Washington’s Mount Vernon conducted similar research tracking George Washington through his diaries. They constructed a a digital encyclopedia article detailing Washington’s travels, but this does not include a map. My hope in the future is to overlap Gates’ papers and Washington’s to see where the two intersect, especially during the Revolutionary years. 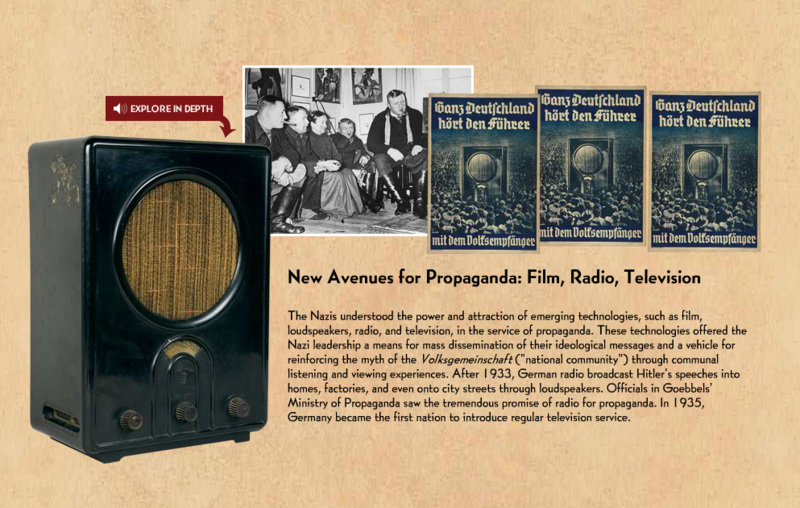 A set of 16 posters based on USHMM’s special exhibition State of Deception: The Power of Nazi Propaganda, produced in partnership with the The Holocaust and the United Nations Outreach Programme, has been translated into 9 different languages and continues to be used as an educational resource for both students and adult learners across the globe. The poster set defines what constitutes propaganda, and “examines how the Nazis sought to manipulate public opinion in order to attain their goals.” Critically, it interrogates the responsibilities of propaganda producers and consumers, and asks viewers to consider their own vulnerabilities to propaganda. The continuing use and relevance of the State of Deception poster set make it a valuable analog resource for exploring new digital techniques to create educational experiences that resonate with today’s audiences, both within and outside the Museum. The proposed digital project would leverage Augmented Reality (AR) to bring the State of Deception poster set to life using digital media. Both the physical State of Deception exhibition and its online counterpart have made compelling use of videos, audio, and artifacts. 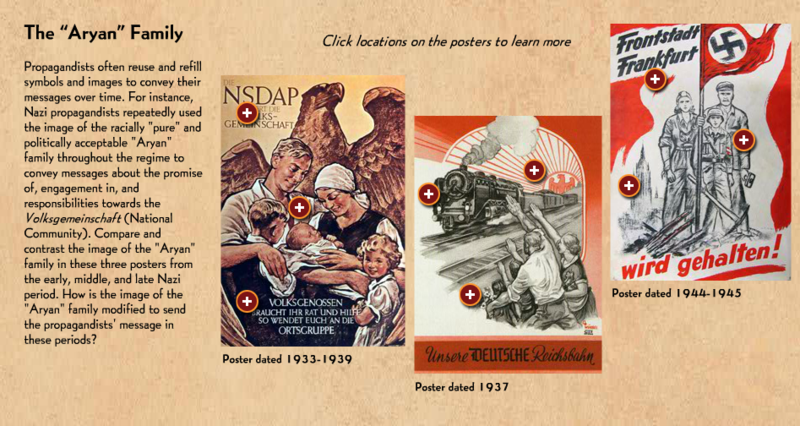 The online exhibition also employs effective instructional design strategies to facilitate a learner’s engagement and understanding, particularly in highlighting the symbolism behind visual elements of propaganda posters and examining the technology used by the Nazi regime to disseminate propaganda. 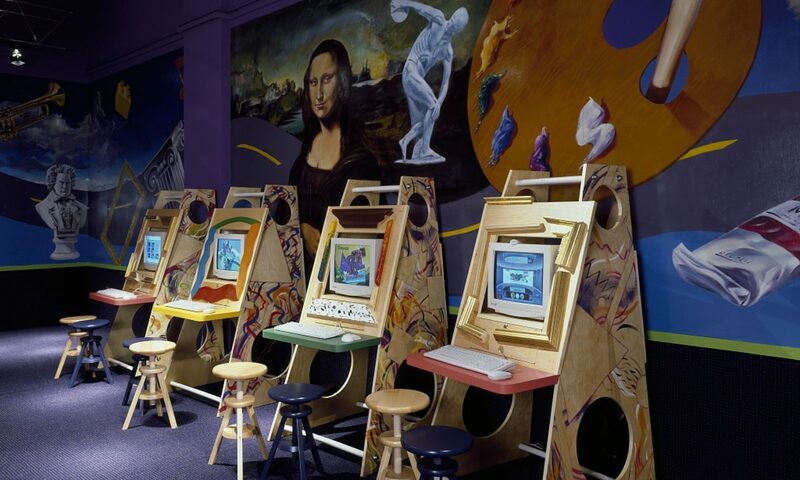 However, the interactive version of the online exhibition requires Flash, a near-obsolete technology mired in security issues. Flash is no longer the standard for accessing multimedia content online, and this means that many are missing out on the content that the State of Deception online exhibition has to offer. The proposed digital project would translate some of this existing online content into an AR experience that users could access using a mobile device, and would be intended to accompany a physical display of the poster set. Augmented Reality affords the ability to layer digital information and media over the real, analog world, and an AR experience can be delivered on a mobile device using image recognition and/or geolocation. Tools like HP Reveal, ZapWorks, and WiARframe allow users with little (or no) technical background to design their own AR experiences. Drawing on existing historical content, I would use one of these tools to create an AR experience for the State of Deception poster set. USHMM, along with other institutions like the Hirshhorn, is already exploring the possibilities that AR offers. 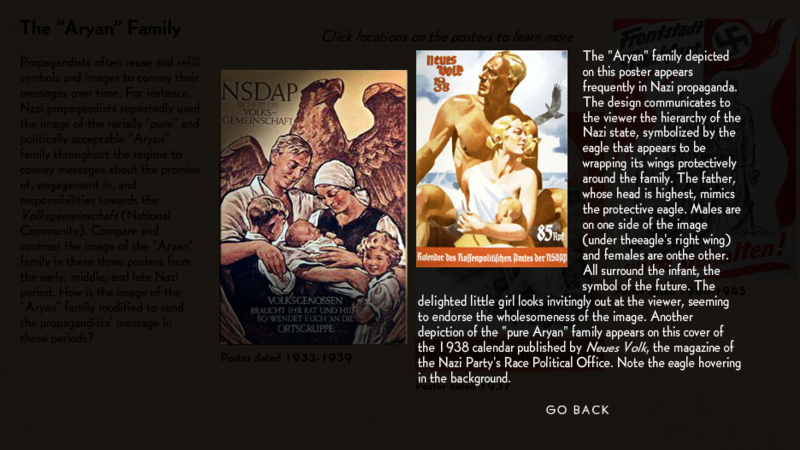 The State of Deception AR poster set would offer another way for USHMM to explore the affordances of AR. The primary goal of this digital project would be to create a prototype AR experience that could be tested with its intended audience, educators and learners. Outreach channels include annual summer programs that bring this audience to the Museum, including the Belfer Conference for educators and Bringing the Lessons Home for local high school students. 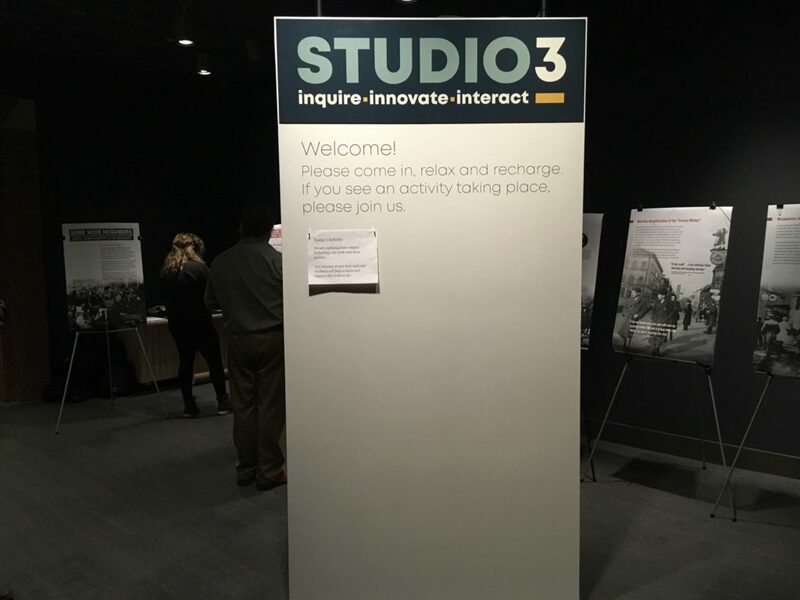 Studio 3 offers a physical space in the Museum for testing prototypes. Rather than metrics like downloads, page views, or duration of use, the success of this project would be evaluated based on what a USHMM team is able to learn from testing the prototype with visitors. 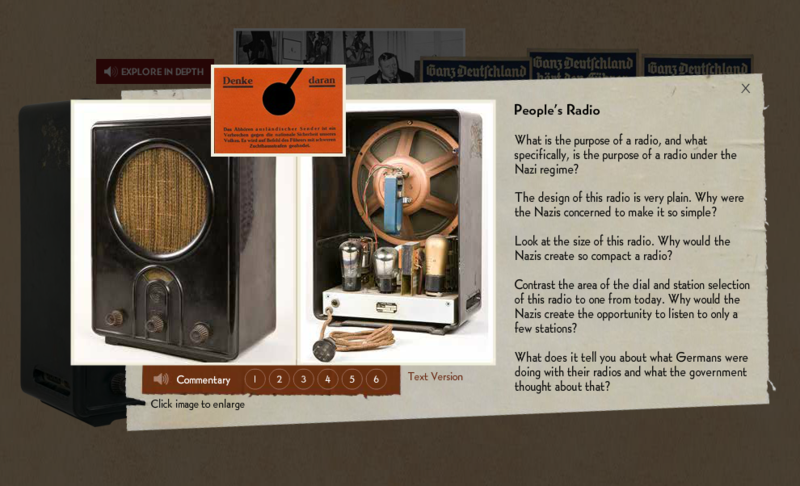 The prototype would allow a USHMM team to explore visitors’ responses to and interest in AR, how AR enhances or detracts from the way visitors experience a poster set, and the strategies and techniques that might be used to strengthen visitors’ knowledge and understanding of Holocaust history. Ultimately, prototyping and testing would provide insight into the question, “What is AR uniquely positioned to do?” so that USHMM can consider the role AR might play in creating engaging and meaningful educational experiences in the future. As someone who has often considered taking on the informal role of family historian, the resources I have found in my preliminary searches offer little in the way of guidance for aspiring family historians, especially those lacking formal academic training. Web services often prize genealogical research as the only form of family history, and seem more interested in selling DNA testing kits than teaching. While some of these sites offer access to digital records and some assistance in performing genealogical research, they are almost universally silent on the subject of conducting oral interviews with living family members, on creating ethical oral histories, and on the actual writing and structuring of a historical project. As mentioned above, the primary audience for this project is aspiring family historians with or without academic training. While I lack any real hard data about the size of such an audience there are a few indicators which suggest that people remain interested in learning and telling the stories of themselves and their families. Though the study itself is perhaps a bit dated in 2019, Roy Rosenzweig and David Thelen summed up their statistical findings in Presence of the Past as such: “Almost every American deeply engages with the past, and the past that engages them most deeply is that of their family.” Putting aside for a moment debates surrounding the ethics of commercial DNA testing and the fact that not every search or subscription to Ancestry.com leads to a detailed family history project, the level of interest expressed by internet users in such sites alone is equally telling. There are currently a number of websites and apps which market themselves as family-history tools, though what “family-history tool” means in practical terms is often record-searching platforms. Ancestry.com is perhaps the largest of such websites though competitors exist in familysearch.org, myheritage.com, and usa.gov. Two of these sites, Ancestry.com and MyHeritage.com, are primarily geared towards building family trees rather than writing a history, and place an additional emphasis on their DNA testing services. USA.gov provides numerous helpful links to the government’s online resources for finding records and data, but is devoid of any helpful content on the actual performance of research and writing. From what I have gathered so far, none of these present any alternative paths to family history than traditional genealogical research which given their nature as businesses, is not necessarily surprising. Currently the closest project I can find to that which I envision is familyhistorydaily.com. Family History Daily offers its users Beginner Guides to Genealogy, Tips and Tricks, and numerous articles regarding issues that family historians may encounter, online record resources they may not be aware of, and evaluations of existing resources like Ancestry.com and MyHeritage.com. Though I have not had time to read through each and every post, I have been unable to find practical tutorials or guides regarding oral history, and I have only found a few that deal with writing history and organizing research. As I lack the technical skill to build a webpage from the ground up, this project would take the form of a webpage built through a service like Word Press. While I am still in the process of determining exactly what content would be most important to include on such a webpage I do have some ideas. One of the glaring issues present in existing tools is their insistence that genealogy is the only form of family history. As such, providing content regarding the nature and practice of Oral History would be crucial to helping address that gap. This content could take the form of blog posts about method and video tutorials on the various types of equipment used by oral historians. In the vein of David Kyvig and Myron Marty’s Nearby History posts about performing primary source research and the many ways that family and local history can be approached would be equally beneficial. Aside from building a social media presence for the project I am not really sure how to go about outreach. Using WordPress’ own tagging system is the most direct form of outreach, but establishing a presence on Twitter (particularly within the colloquial “HistoryTwitter” or under #Twitterstorians) would be an additional step. On a more hypothetical level, reaching out to established professional associations within history and public history might be a fruitful way to spread awareness of the project, though I have my doubts about how far posts made by professional associations go into the non-academic side of social media. Hosting in-person workshops at public libraries could be another way to drum up interest in the project while also working towards its overarching mission. This is all assuming that I could get the project established to an extent that they would be willing to work with me. In an abstract sense, success for this project would be if people could visit and feel empowered to approach family history beyond building a family tree and away from bogus DNA testing kits. In a hypothetical world where I could actually build a sustainable online organization that had clout with real institutions, an Oral History or Family History workshop with more than 0 attendees would be an additional success. In terms of what I could reasonably accomplish for this project by the end of the semester, I would say constructing a web-platform through WordPress, a handful of social media accounts, and some written content are the most realistic outcomes. I do not own any recording equipment so video tutorials on the practice of oral history are for the moment beyond my capacity. On a more personal level, if this project could be the impetus I need to finally get around to starting my own family history efforts, I would count that as a success of its own kind. In the most generally known narrative of American history, George Washington appears on the stage of world events fully formed. Washington strides into history as the tall, dignified adult who assumes command of the Continental Army and directs the victorious war for American independence. This same imposing figure then guides the newly launched state of ship safely through its first years of operation as President, before relinquishing power in the ultimate gesture of republican virtue and retiring to Mount Vernon. With the exception of the story of the cherry tree, perhaps now more famous as a tall tale than as historical truth, Washington’s youth is essentially nonexistent. The Father of the Country is always that, the older, mature figure in the room – never the young son. But decades before Washington showed up to the Continental Congress to take the offered position as military leader of the fight against the British empire, his early 20s were spent acting as an agent of that same empire. In 1753, when he was only 21, Washington embarked on a harrowing frontier journey to attempt to force a diplomatic resolution to a long-running dispute between Britain and France over the poorly mapped, sparsely settled Ohio River Valley. A year later, at age 22, Washington was a colonel of militia charged with forcibly evicting the French from a fort at the site of modern-day Pittsburgh – a mission which sparked a world war and created the conditions that would spark the American Revolution two decades later. Washington’s younger years are little known to the general public, despite their fantastic and adventure-filled nature. For my digital project, I propose to bring those adventures to life in a digital visual medium. Specifically, I would use the StoryMap program developed by Northwestern University Knight Lab. StoryMap allows users to create narratives using location, images, and movement. By using points dropped onto a map in a certain order, a StoryMap moves a viewer through the story spatially, not just temporally. Each point contains both text and images, providing snapshots of connected moments in history. I would propose to use StoryMap to retrace Washington’s early 20s on the colonial frontier, specifically immediately prior to and during the French and Indian War. This would move viewers through portions of modern-day Virginia, West Virginia, and Pennsylvania, as Washington traveled on land and water across a space where imperial ambition, colonial expansion, and Native American relations collided to form a crucible of massive historic significance. In this project I will be able to draw on my previous experience using StoryMap, but deliver a better-quality project by using the practices we have been discussing in class. I will also be able to draw on my knowledge of the time period, which is my historical focus. The end result will be an easily accessible and understandable digital presentation that will help more people learn about the incredible story of Young George Washington.